This pen was nspired by the European Baroque sensibility. It incorporates a number of intricately cast decorative motifs including scrolling foliage, garlands and flowers as decoration. The bands at the center and nib feature a stylized acanthus leaf design further celebrating this unique Era. The finished pen has a bit of heft and provides a substantial writing feel. Features a Parker style refill for smooth writing performance. 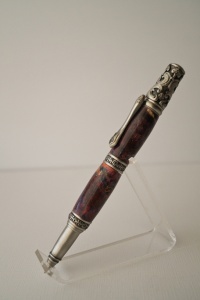 The pen is dressed in a maple burl that's been dyed a subtle purple. This dying process still permits the unique swirling gran patterns unique to all burls.